Every once in a while, I’m struck by how an old or older “technology” really is better than something newer and allegedly better. Take, for example, a cast iron fry pan. Old, new, can’t tell with one of these. I never owned one until very recently. Why? Well, because this new Teflon non-stick coating was so much better. Granted, I have to throw out a non-stick pan the moment the coating started to get scratched as its toxic to ingest, but it was still so much better, right? I was feeling wasteful at having to toss out pans if the coating got scratched. I was also feeling a bit nervous about cooking on a toxic surface, so I tried the next greatest new thing. The ceramic pan. Except, that scratches, too. And yes, I use only plastic utensils on the pans, which, I’m not entirely sure if that’s great choice either, as plastic does bad things at higher temps. So, I was hanging out watching Netflix when an old cooking show came on and the host was talking about how amazing cast iron is. I ignored it, but the thought was percolating back there for some time. So, when I was looking at having to toss yet another scratched pan, I decided to try the cast iron. Holy wow, this really is a weapon. 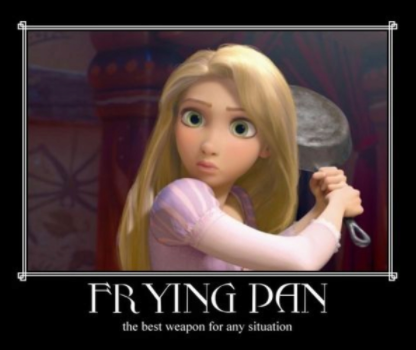 And here, I thought Disney was just teasing with Rapunzel using it as a weapon. They weren’t. The basic cast iron 12 inch skillet I bought weighs over seventeen pounds. It was approximate seventeen dollars, which makes me wonder if these are sold by the pound. But I digress. Yes, these really can be used as a weapon. There are some pros and also some cons to our new pan. It does an amazing job browning food. It goes directly from stove top into the oven. This means no extra pans to clean when you need to say, brown steaks, then finish them in the oven. It cooks faster than other pans. I add this as a pro because it will be in the long run. Right now, I have to relearn all my cook times for things. It’s cast iron. Nothing toxic getting into my food. I don’t think you can scratch it. Time will tell on this. I always feel like this. Clean-up. You can’t pop this into the dishwasher. After it cools, you have to scrape all the particulate off of it, wash it, then completely dry it. Once that’s done, you have to rub a bit of cooking oil over it to protect it. Yeah, kind of a pain. 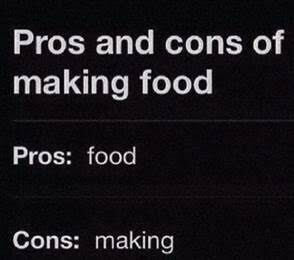 For the moment, the pros are outweighing the cons. I’ll see if I’m still using it in a year. How about you? Have you ever cooked with cast iron? Do you like it? What are your thoughts on non-stick pans? Any other kids of pans you can recommend? Hah! -applauds- My late mother bought me my first cast iron pot set for my 21st birthday. I’m now 64 and I’m still using them. In fact, I’ve added to them by buying two el cheapo cast iron frying pans from the camping goods shop. You do have to scrub off the protective coating and then temper them by cooking a load of cooking oil in them, but once they’ve been in use for a year or two they develop a beautiful surface [on the inside] that can be scrubbed with soap and water and does not need to be rubbed with oil. Your mom was brilliant. Here I am just now discovering them! And yes, I’ve heard of these pans being passed down in families as heirlooms! Non-stick surface is toxic? Hmm, that explains a lot of things. I love my cast iron pan. It gives me a good workout when I cook, and I feel secure in my ability to use it to incapacitate burglars. But you’re right, it’s a pity it’s such a pain to clean. Yes, they actually are. You’re supposed to get rid of them if they get scratched as the ingesting the coating can cause cancer. Also, if it gets too hot, it lets off a chemical that’s toxic. I’m too scared to eat now. Love my cast iron! And ceramic! !